Do you need a best tactical and brightest Led flashlight for the money? If yes, then you have come to the right place. Here is a list of the top 3 brightest handhelds LED flashlight in the market today with trusted reviews backing them up. There are so many flashlights available today that you may find it difficult finding the right flashlight for your needs and requirements. 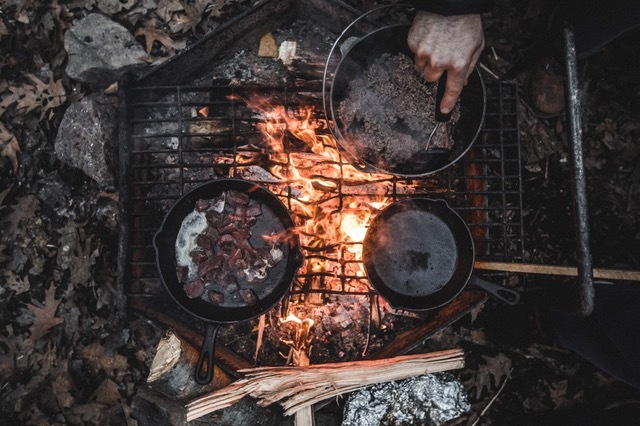 This is why this guide is here to help you find the best-LED flashlight to use on your next camping trip, for hunting purposes like you can use it with a gun, Air Rifle, crossbow for deer hunting , for self-defense or just for use on your bedside table. To start you off, here are some of the best-LED flashlights available today. Just check these reviews to find out if any of these flashlights fits your needs and requirements. Remember there is no perfect flashlight as they all have their individual positive and negative reviews from its users. Here are the top 3 rated best-LED flashlights appreciated by customers all over the world. By reading and learning more about the features of these flashlights, you will be able to make a smart decision in choosing the best-LED flashlight. The high lumen tactical light with a white LED from Streamlight 88040 ProTAC HL runs on C4 LED technology, which gives it its extreme brightness. Its LED solid state power regulation provides maximum illumination throughout the life of the battery. This is one of the brightest LED flashlights that is waterproof to a depth of 1 meter for as long as half an hour and comes with an anti-roll face cap. The torch has also been tested for 1m impact resistance and serialized for its identification in case the torch is misplaced or lost. The torch can be used in 3 different operating modes where the highest output level is at 16,000-candela peak beam intensity for 1.25 hours, at low beam with 800-candela peak beam intensity and 33 lumens brightness for 18 hours and as a strobe for 2.5 hours. This torchlight is the brightest addition to the ProTac series as it 600 lumens of blinding light illuminates 253 meters of beam distance. The torchlight is multi-functional with a push-button tactical tail switch. The torch can be easily handled and can even be operated with one hand through its variable intensities and strobe mode. Its TEN-TAP programmable switch lets users select between one of three different programs viz. high, strobe or low which is the factory default mode. The small size and the output from the torchlight’s C4LED make it one of the best-LED flashlights available for its size. The torch is sold with a removable pocket clip and holster and is just right for use by law enforcement and security personnel, emergency medical services personnel, as a hardware tool while sporting and just for consumer use. The Torchlight is made using 6000 series machined aircraft aluminum that comes with an anodized finish. It has a glass lens and an o-ring seal and comes included with 2 3’volt-CR123A Li batteries that have a ten-year shelf life. As this torchlight does not run on rechargeable batteries, this is perhaps the only disadvantage associated with the torchlight. You have to buy new batteries if the batteries lose its charge and need replacement. It has Dual Output LED torchlight is a highly efficient, failure-proof LED that delivers 15 to 500 lumens of focused light. This is one of the brightest LED torch lights that is pocket-sized that is activated with a click-type tail cap switch. This tail cap switch offers the benefit of getting locked out to prevent any accidental activation of the torch when in transport or storage. The torch is durable as it is constructed using high-strength aerospace aluminum that is hard anodized to military specifications. It is this construction of the torchlight that gives it its resistance to abrasion, corrosion, and scratches. This is one of the most portable flashlights available. When used with a 15-lumen level brightness, the torch can be utilized for general work at short distances for as long as 46 hours while the 500 lumen of focused light qualifies this torch as a pocket-sized searchlight, which can be used for as long as 1.5 hours. Whichever setting you use the flashlight, its precision micro-textured reflector delivers a smooth and wide beam of light with a bright center area and generous peripheral light. This coated, tempered reflector effectively resists impact and thermal shock while maximizing light transmission. The torch is only 5.4 inches in length and weighs only 5.7 ounces with batteries. Two 123A batteries come included with the flashlight. This is one of the brightest LED torchlights’s available which has no associated disadvantages just that it gets hot if you use it for a long time, especially on high beam. This is a disadvantage which any exceptionally bright torch may exhibit, which is thus not a problem to worry about. The HexBright FLEX 500 LED flashlights are the best rechargeable flashlight available, which is powered through its single CREE XM-L2 LED. It also has the rechargeable battery. With rechargeable batteries around, you no longer have to buy disposable AAs. All you have to do is plug the torch into a USB port to let the battery charge and then start using it. The torch and its interior battery carrier are CNC machined using rugged aircraft grade aluminum, which is what makes it the long life. The exterior of this best-LED flashlight is ergonomically designed to give a comfortable fit in your hand easily. It is this seal that makes the torch waterproof to a maximum depth of 3 feet of water. The torch light has an open-source Arduino-compatible microcontroller which lets you customize and use your flashlight as per your requirements. If required, the Torch can be customized to glow on detection of a fall so that you can find your torch even in the dark and can even be customized to flash short messages in Morse code. At a mere blink of its button, the torch can also be programmed on low 50 lumens which will give light for 35 hours, medium 175 lumens for 8 hours and a high beam of light of 500 lumens for an hour. By pressing and holding the button, you can also use the torch to produce a flashing strobe light effect. This FLEX Torchlight has a built-in temperature sensor that automatically switches off if it senses any chance of overheating. Its computer chip monitors the charging of the torchlight and stops charging when it’s full. The flashlight comes with accessories like a wall charger which you can use to charge your flashlight without your computer, a micro-USB cable which you use to charge the torchlight while you work on your laptop and a Li-ion battery. There are no disadvantages associated with this torch; some customers just complain that the torch can’t be used outdoors much as it needs a wall socket or laptop to recharge its battery. This is, however, a drawback associated with all rechargeable torch lights and nothing to worry about. 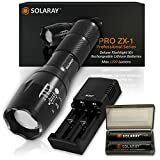 Garnering an average rating of 4.5 Stars is the SOLARAY PRO ZX-1 Professional Series Flashlight Kit. As the best tactical flashlight for the money, the SOLARAY Pro is a premium energy-efficient, high-output tool, boasting a long run-time and makes use of lithium ion battery. This gear is the best company in the dark with a very powerful, ultra-bright LED chip, a tactical security design with a Disrupter Strobe as well as a strong front mounted self-defense striking bezel. This small tactical flashlight includes a deluxe 2-battery cordless battery charger, including an adjustable focus zoom lens. You can get this kit with a bonus 1 lithium battery and a 3 LED solar keychain. Based on users’ reviews, this tool is ultra-bright with enough power to light up a whole room or zoom in on a distant object. The batteries are premium SOLARAY 18650 3.7v 2200mAh imbedded with a protected circuit board (PCB). Similar to the Fenix PD35, the ZX-1 Professional Series Flashlight Kit can be operated in five various modes in a simple click of a button. This includes the low, medium, and high beam strobe, the bright tactical intruder strobe, and the SOS emergency signal mode. These modes make this equipment very versatile as the zoom lens provides the ‘throw’ or distance coverage, and the ‘flood’ or wide coverage. The SOLARAY PRO features an unmatched durability due to its water-proof aircraft-grade aluminum body. The quality lens is guaranteed with a premium tail switch engineered for a lifetime use. Indeed, this is the best compact flashlight with a balanced weight-to-size ratio, making it perfect for all types of users. It is small enough to fit virtually anywhere but large enough to meet the most demanding lighting needs. 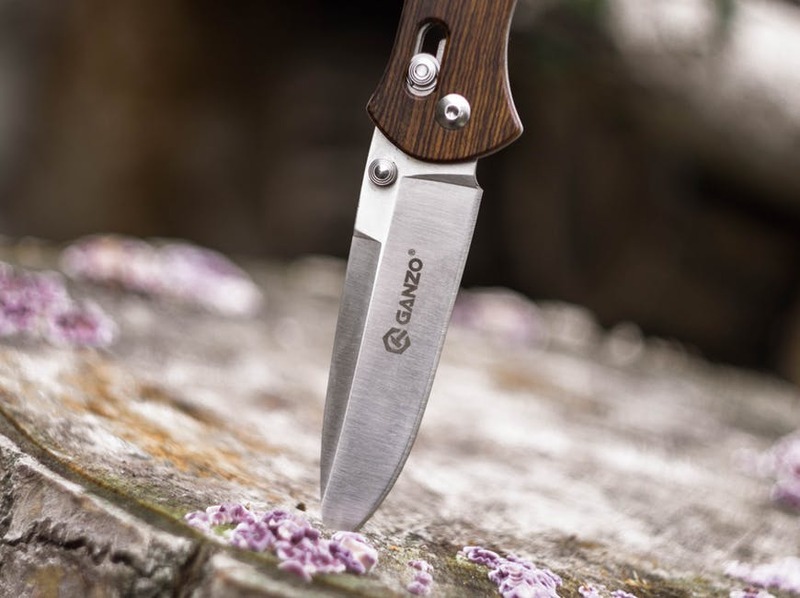 This tool is your best friend during power failures, camping, fishing, hiking, night walks, and so much more. 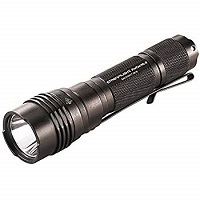 Among the top rated tactical flashlights is the Fenix LD22 215 Lumen Flashlight with a 4.5-Star average rating on Amazon. This torch offers a reliable illumination in wide ranges of applications. The Fenix LD22 features 4 brightness levels, strobe, and hidden SOS. It is powered by 2 AA batteries while delivering a maximum of 215 lumen output. It can last for up to 150 hours, a long runtime that is perfect for any application, ranging from outdoor activities to urgent conditions, and recreations like caving, hiking, climbing, camping, and so on. The Fenix LD22 215 Lumen Flashlight makes use of Cree XP-G2 LED that has a lifespan of 50,000 hours. It also makes use of two Ni-MH alkaline batteries. This tool measures at 156mm in length and 21.5mm in diameter, weighing at 60 grams without the body clip and batteries. This is the best small tactical flashlight with a digitally-regulated output that helps in maintaining constant brightness. Similar to its brother, the Fenix LD22 features a reverse polarity protection that serves as a guard from improper battery installation. It also has a slip-resistant and anti-roll body design, with a push-button tailcap switch with momentary-on function. Furthermore, there is a side mode switch in the front for faster and more convenient operation. This torch is likewise made of very durable aircraft-grade aluminum body with first-class Type III hard-anodized and anti-abrasive finish. The Fenix LD22 215 Lumen Flashlight also boasts a toughened ultra-clear glass lens with an anti-reflective coating. Among the quality flashlights, Fenix LD22 features six outputs, including the Turbo (215 lumen), High (105 lumen), Medium (50 lumen), Low (3 lumen), and the strobe and SOS. Purchasing this item also comes with a limited lifetime guarantee from Fenix Lighting, USA. All in all, the Fenix LD22 is slimmer in design than most 2 AA-battery torches, making it very easy to carry. The Streamlight 75434 Stinger LED HL Rechargeable High Lumen Flashlight also receives an average rating of 4.5 Stars on Amazon. This torch features optimized electronics, providing a regulated intensity during battery charge. This pocket flashlight accepts either NiCd battery or NiMH battery, which is rechargeable up to 1000 times. It has anodized aluminum construction, along with a non-slip rubberized comfort grip. It is also IPX4 water resistant and one-meter impact resistance tested. This torch is perfect for those in search of maximum illumination with a wide beam to search a large area. This high lumen flashlight offers a blast of 640 lumens together with a 297-meter of beam distance. Tactical flashlight reviews will reveal the impressive 3 lighting modes and strobe of this torch. The High mode for high lumen and ultra bright light, the medium mode for intense brightness, plus longer runtime, the low mode for extended run times and less intense beam, and the Strobe for disorienting or signaling. The Streamlight 75434 boasts a C4 LED technology and is shock-proof. Its deep-dish parabolic reflector is capable of producing a concentrated beam with maximum peripheral illumination. It also boasts the unbreakable polycarbonate lens with a scratch-resistant coating. These key features are the major strengths of the Streamlight 75434, making them very important in one way or another, while this torch its uniqueness. This flashlight’s exceptional performance is attributed to its delivery, offering three lighting modes and strobe for varied options for the user to choose from. Included in the kit is a charger or holder of the torch, a 120-Volt AC/12-Volt DC Piggyback charger that offers a 10-hour steady charge or the 2.5 hours of fast charging option. However, these options are sold separately. Overall, the Streamlight 75434 is among the best tactical flashlights the market has to offer. A 4.5-Star-Rated pocket flashlight is the Klarus XT11 CREE XM-L2 LED Flashlight with a maximum output of 820 ANSI lumens, and CREE XM-L2 LED. It makes use of 1 18650 or 2 CR123A battery types. This torch also features a dual-button tail switch and an IPX-8 waterproof design. At maximum, the Klarus XT11 runs up to 73 hours with its dual-button tail switch for a quick, one-hand operation. The flashlight’s mode switch provides good tactical feedback, which is very easy to locate in the dark. The Strobe can be activated with the Mode Switch when it is on or off. It also features a Forward tactical main switch with momentary activation. This torch can maintain constant brightness with ultra-high efficiency. Its CREE XM-L2 (U2) LED has up to 50,000 hours life pan with three lighting modes and one flashing lighting output. It comes in black body color with textured orange peel reflector. Among the high lumen flashlights, the Klarus XT11 has a Tactical Main switch, allowing the user to turn the light on and off with momentary activation, while the Dedicated Mode switch allows instant access to changing modes and strobe. The lens is made of toughened ultra-clear glass. This torch measures at 143mmin length with a 34.9 mm head, 25.4 mm body, and 26.2mm tail. It weighs 118 grams without the battery. The Klarus XT11 kit includes accessories like a lanyard, body clip, holster, two extra O-rings, and a tactical ring. This high lumen flashlight equates to second-generation switch, which is better than before as the Mode switch can be activated at any angle, compared to the first-generation switch that requires the Mode button to be activated vertically. This second-generation switch tends to prolong the life of the tail switch mechanism while protecting it at the same time. Included in the XT Series Design, the Klarus XT11 still offers the same great brightness, and it is battle-ready as it is equipped with stainless steel strike bezel. This flashlight’s IPX-8 dust and waterproof features assure you of high performance. The Fenix PD35 2015 TAC Edition Tactical Flashlight garners an average rating of 4.5 Stars on Amazon, having a maximum of 960 lumens through its Cree XM-L 2 LED, which offers a lifespan of 50,000 hours. 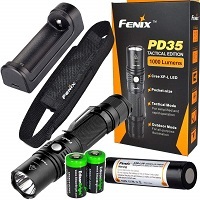 Among the best tactical flashlights, the Fenix PD35 makes use of either two 3V CR123A Lithium batteries or one 18650 rechargeable Li-ion battery. Thus, this bundle from Amazon includes two EdisonBright CR123A lithium batteries. The Fenix PD35 measures at 5.5 inches in length, 1 inch in diameter, and weighs at 87 grams. It features a tactical tail switch with a momentary-on function. It is one of the most dependable flashlights on the market today, although it does not feature any way to adjust or narrow down the beam. Essentially, it is a floodlight torch, boasting four modes of operation – the Turbo, High, Mid, Low, and the Economy. This device works in the Turbo mode at 960 lumens and lasts for an hour and 10 minutes, while the High mode at 460 lumens lasting for 3 hours and 15 minutes. It also works in the Mid mode at 180 lumens that last for up to 10 hours, consuming 50 lumens and working up to 38 hours at the Low mode, and finally, the Economy mode works for up to 150 hours at 14 lumens. The Fenix PD35 also features a digitally regulated output, maintaining constant brightness, just what you need with a tactical LED flashlight. Moreover, it has low-voltage warning function that reminds you to replace the battery. The Reverse polarity protection is helpful in guarding the unit against improper battery installation. This tool also boasts an over-heat protection, avoiding high-temperature of the surface, while having an anti-roll and slip-resistant body design. It has a side-switch on the head for better versatility. In all, the Fenix PD35 is a high lumen flashlight made of durable aircraft-grade aluminum with premium Type III hard-anodized and anti-abrasive finish. While the above mentioned tactical flashlight reviews will give you a clear idea about these amazing products, you still have to consider more things, while choosing from the wide array of high lumen flashlights on the market. Below are major factors to remember, before placing your order. Those who make use of the brightest tactical flashlight are under certain jobs or specific activities, needing a professional-grade torch. So, if you consider yourself one of the following, then you surely need a reliable flashlight! 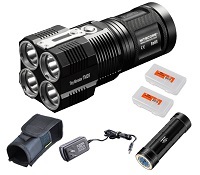 Outdoor Enthusiast – If you are into trekking, hiking, camping, fishing, or hunting, keeping the best tactical flashlight with you all the time is very sensible. Having this assistance also comes in handy if you are a hunter or into the shooting games. Military – The military personnel requires an efficient flashlight, especially when engaging the enemy. Mounting a flashlight on a weapon will enable them to see clearer and intimidate the probable enemies. These torches are similarly helpful once they traverse jungles, caves, and encampments. Law Enforcer – All law enforcers also need a reliable pocket flashlight, whether you are a police officer or a security guard. A flashlight is an essential tool in your arsenal, giving you the capability to see clearly at night. Ordinary Worker – Today, many workers in different fields depending on a durable flashlight such as farmers, truck drivers, and firefighters. This handy tool is very efficient during emergency situations and rescue operations. Ordinary Citizen – If you’re an ordinary citizen, you still need to have the best pocket flashlight on your bedside table for emergency and self-defense purposes. The ANSI FL1 Standards have finally leveled out the playing field when it comes to flashlight and torch producers. Hence, the entire flashlight industry should comply with these guidelines as they design and sell their products on the market, ensuring the consumers with no less than the top tactical flashlights. Thereby, the set standards also follow specific regulations, surrounding the basic parts of this essential tool. As a probable buyer, you should also arm yourself with the factual information and learn about the basic parts of a reliable flashlight. Light Output – This part of the flashlight is equivalent to the Lumens rating, showing the total amount of light that comes out of the front of the torch. Beam Distance – This is mostly measured in meters, indicating at which the intensity of the beam reaches. Run Time – Runtime is the amount of time it will take for the light to get to 10% of its initial output. Peak Beam Intensity – This is the brightest point in the beam and measured in Candela. Impact Resistance – Also included in product descriptions is the impact resistance, which is measured in meters, indicating the height that a flashlight can be dropped from onto concrete, but will still work properly. Water Resistance – The levels of water resistance range from IPX4 to IPX7, and IPX8. IPX4: Flashlights with this rating have been tested to perform properly under the condition of splashing water. IPX7: High lumen flashlights with this rating have been tested to perform properly, even though submerged to 1 meter for 30 minutes. IPX8: Flashlights with this rating have been tested to perform efficiently, despite that they are submerged deeper than 1 meter and surpass up to 4 hours. Besides a pocket knife, a flashlight is among the most useful tools that anyone can carry on a daily basis. A pocket flashlight offers countless uses and benefits even for the ordinary individual. Below are the most basic uses of a flashlight, so, having one would be very nice. The main purpose of a flashlight is to identify things, despite the darkness of the surroundings or any environment. Having a flashlight in your pocket can give you peace of mind, illuminating a dark parking lot or an alley. There’s no more need to worry about what’s lurking in the dark. Emergency situations range from power interruptions to natural disasters, and so on. Thus, having a light right from your pocket is something invaluable. Rescue situations and survival need also require this important thing, using it as a kind of signal, especially for those in need of rescuers. The best tactical flashlights are now used as a sort of self-defense mechanism, giving someone an advantage during combat situations. In fact, the hard anodized aluminum on the flashlight can be used as a striking tool, while the crenulated bezels can be used in breaking doors and windows, if necessary. The following are the top five tips when buying the top tactical flashlights on the market. This quick summary will ensure that you will get no less than high-grade and durable products. Budget – The most decent torches usually cost at about $25, but these are the penlight or keychain flashlights. Opting for the high-end flashlights usually cost about $70 or more, while ensuring modern technology and more durable materials. Size – The size is an important factor to consider as well. With this in mind, you have to determine on how comfortably you can carry one, whether all the time or for a specific period. Otherwise, you have to keep in mind the available space for storage. Power Source – The power source is a great way to identify the flashlight that you need. Should you need a disposable one or a flashlight with rechargeable batteries? Flashlights with the standard size battery are the easiest to find, while those with a special battery will have to consume more power. Amount of Light – The amount of light that a flashlight can produce is attributed to the ‘Lumen’ in a tactical flashlight review. The range of 60 and 100 lumens can already cause temporary blindness. Durability – For many customers, a professional-grade and the most durable flashlight would have LED bulb with at least IPX7 waterproofing rating and Type III hard anodized aircraft grade aluminum body. Hence, a very durable tactical LED flashlight should not have electrical issues, and made of durable materials like titanium or special plastics, aside from air-craft grade aluminum. Durability can also be equated to shock-proof design. Rechargeable Flashlights – These types of flashlights have almost the same characteristics as the non-rechargeable counterparts, but with the added benefit of saving money and conserving the environment over time. Keychain Flashlight – This can be a small tactical flashlight that offers the most convenient handling and maintenance with a size that can fit virtually almost anywhere. This one features a key-ring loop, although not a very strong one. AA Flashlight – This type of flashlight works with the standard size batteries. AA batteries are the most common in the world, finding them everywhere. Most of these types make use of either one or two AA batteries like the above-mentioned models. Compact Flashlight – You can take this one anywhere you go as this type is organized by an overall length with a simple profile. Some high-end flashlights can still put out up to 1000 lumens. Nothing beats the best tactical flashlight when it comes to special tasks. So, you have to keep in mind all the factors, surrounding a reliable and durable flashlight, before making a deal. Choose an LED torch as much as possible, and then you can rely on Xenon or a Halogen variety. The flashlight you have to pick should have at least 100 lumens light output power. It should also have to boast a center beam with peripheral lighting that is ultra efficient. Moreover, make sure of the flashlight’s durability as what has been mentioned above. Ensuring the quality and durability can be attributed to the construction, considering the aircraft-grade aluminum material. As what is advertised, this material ensures supreme durability, not to mention that such tools usually last for a long time. All in all, never settle for anything less when it comes to tactical flashlights. Choose the best tactical flashlight for the money as this tool can become your best buddy, an emergency or survival kit, or just the handiest piece of equipment for your everyday needs. If you want the brightest tactical flashlight, you can make a better choice if you consider the following factors before making your choice. These tips will prove very helpful to you at choosing the best rechargeable flashlight for all your needs. The light output of Torchlight is measured in lumens and is, of course, the most important factor to consider while choosing a new flashlight. Lumens are basically a measure of the flashlight’s light intensity and are an excellent way to compare the brightness of flashlights. However this is not the only factor that determines the brightness of a torch; its beam range, beam type and beam intensity all influence the flashlight’s brightness. If you do not thoroughly understand the concept of lumens, these comparisons may make it easier to understand. 20 lumens brightness is the amount of brightness you need to read a book while 60 lumens is so strong that it will temporarily blind a man. However, 3000 lumens is so much of brightness that it can set a piece of paper on fire. 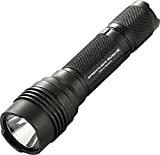 On an average, most consumers prefer looking for the best rechargeable flashlight with brightness between 150 and 250 lumens as these flashlights can be used both as a tactical flashlight in self-defense against an attacker and an all-around flashlight that can be used in your home, outdoors, your car and wherever it is dark. You can buy flashlights which use disposable batteries or rechargeable batteries that have to be charged using a USB connect, solar panel or a wall outlet. Most consumers like using torch lights with rechargeable batteries as its running costs are very low and can compensate the higher upfront costs. Moreover, these batteries are environmentally a better choice as they help the environment with its reduced wastage. To top it all, rechargeable batteries are usually stronger and thus help increase the torchlight’s runtime. This is why manufacturers usually mention how long the flashlight runs to help make it easier for you to choose the brightest tactical flashlight. Most flashlights have various output levels which can affect the torchlight’s runtime, which is also mentioned by the manufacturer. Flashlights are mostly buying to carry with them wherever they go. This is why you need to know and compare the size and weight of the flashlights to ensure it is as portable and compact as you need. It is the lens reflector that surrounds a bulb that influences the distribution of the light. The three common beam options offered by the brightest LED flashlights include flood or fixed, adjustable and spot or focused. LED technological advancements have made most of the available bulbs out of date. While some flashlight models still operate with incandescent bulbs like krypton bulbs, it is rather difficult for these bulbs to overcome the run time, brightness, energy efficiency and impact resistance options offered by LED flashlights. The brightest reliable LED Flashlight are those that offer optimum and regulated near-peak brightness supply through the life of most batteries. In the case of an unregulated light source, it starts off by producing a bright light and then grows dimmer as the power from their batteries gets drained. So if you plan to go on a camping trip, you need a reliable and constant source of light which is offered by LED flashlights. These factors and tips should thus prove helpful for you to choose the best rechargeable flashlight. Advanced technology now lets you sit in front of the computer or your Smartphone and buy the brightest handheld LED flashlight from the comfort of your home. You no longer need to spend time traveling and looking for flashlights in stores or shopping centers. Instead, make a visit to the very large online shopping center Amazon which is visited and used by millions of people from across the world to buy whatever they want, including torch lights. In fact, it is a wise decision to buy your LED flashlight through Amazon. You can go through the many customer reviews provided here to find out what past customers have to say about the products they buy. You get a firsthand experience of using the products and thus know if there are any flaws or hidden problems with them. # The FLEX 500 lumen programmable LED flashlight from HexBright has 436 customer reviews and has an average customer review score of 4.9 out of 5.0. 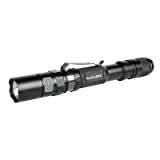 # The P2X Fury Dual Output LED Flashlight from Surefire has 279 customer reviews. # The black ProTAC HL High Lumen Professional tactical light with white LED from Streamlight 2,505 customer reviews and an average customer score of 4.6 out of 5.0. So thank you for your patience and valuable time spends going through this review. This review has all the features and customer reviews about the top 3 brightest LED flashlights in the market today. It is now left to you to decide which flashlight you want to get for your individual needs and requirements based on these features and of course, your budget.